The sketch for the sign was done in a sketching program, but stuff like text, I always do in Corel first, then export it out as an image file. I figure, I'll need the vectors for the text anyway, so the beginning is just as good as anything to get them laid out. Plus, I do the vectors to actual size, so I can get a handle on the final, overall project size in the sketching software! Then in the sketching software, every element gets drawn on a separate layer, so I can turn everything on or off, as I need. With the text turned off, I can export a fairly clean image to bring into hexagon, this lets me see where all the leaves of the bushes belong, and they're overall shape, as the text block a lot of the leaves from view. I started in 3d with the log, soccer ball, and the water splash, using the sketch as a basis for everything. I wont texture anything in Hexagon, as it's way more efficient to do in Aspire, when I move to that software. I did force the perspective on the log, so you could see the end better, just to give it a bit more awesomeness, and look like the original sketch. The leaves were next. I only modeled one, then used the modifiers in Hexagon, to bend, squash, and twist the original leaf into the rest of leaves for the bush. I did these one at a time, laying them on the sketch for size and placement. Bouncing over to Aspire, I imported my already created vectors, and used the 'Create Shape' tool to build them up to their final 3d shape. Text is so super fast to create in 3d in Aspire, plus it's usable for machining, it doesn't make sense to create the text anywhere else. With everything modeled, and in place, I brought in the 3d text from Aspire, so I could do a final tweaking to the under/ overlap of the leaves on the text. I planned from the start that this sign would actually have very little undercutting on the geometry. I'm totally OK with the final look that will give. Except for the water splash. I certainly don't want the splashing water to return right back to the sign. This will look pretty good from the side view! So I split off all the water splashes from the trunk of the splash, as they'll get cut as separate pieces. Once the drops were cut off, I split each one in half, and laid the flat side of each one on an imaginary zero plane. This way I can import them as a group into Aspire for machining. I sense HDU dust in my very NEAR future!! Recently we were contacted to create a sign for the Town of Tweed, more importantly, a sign for a new splash pad in the Town of Tweed. This new splash pad is being created in honor of a little girl named Emily Trudeau, who is no longer with us all. I won't go into to much detail here, but you can certainly click her image above, and the link will take you to the article about the new project. We were given a list of everything that could hopefully be incorporated into the sign, so it was a hard task deciding what works, what doesn't work, and what things to finally settle on. Sometimes, a blank canvass can be overwhelming!! We were also supplied a preferable color palette as well. In the end, I decided on a few items, that seemed to all work together well, without the sign becoming a collection of "stuff". I didn't want anyone quickly seeing the sign, and have to try and figure out what it was. Soccer was a big part of her life, she loved splash pads, butterflies, and carnations as well. And I really wanted the final piece to be fun! Something that if I saw it, would make me smile, and a smile is a pretty big gift to be able to give someone! 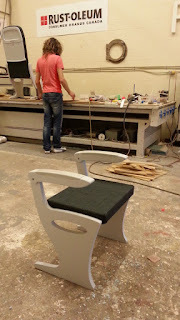 With all the components painted, it was on to upholstery! A sewing machine is not my most favorite piece of machinery, actually sewing is my least favorite activity that we do. Fortunately, we don't get to do it all that often! You can't actually see it clearly in the pictures, but we also added a magazine pouch, in-case they need it! All in all, it is quite a simple little set. And this is approximately what the final comp will end up like. If it was lit properly, and the tarmac didn't have our screw cabinet sitting on it, I'd believe it was shot inside a plane! De Plane Boss De Plane!! The arm rests were the next job to be tackled! We're only making 3 in total, as any more would be completely out of frame. And if they actually need anymore seating than we built, they have the option of shooting plates, and assembling them in post-production. Each arm-rest was comprised of 4 pcs of 1/2" MDF, laminated together. Once the glue had dried, I ran a 1/2" radius cutter around all the edges, just to soften them a little. While I was setting up our Techno cnc for the rest of the seat parts, Jody vac-formed .060" PETG over all 3 arm rests. She did this so we could cut the tops off the pull, and use them as arm rest pads on the tops of the arms. The seat bases were cut from 3/4" plywood, edge sanded and filled to be smooooth! I'v got my boarding pass ready! Next on the chopping block was the wall section. This section just has 3 windows in it. In the concept sketch, there is only one window that the actor is looking out of, but we added a window on each side so that light could come through, and look a little more real in the final image. These probably will never be seen, but you never know in the end! This was cut from 3/8" flexi-ply for easy bending. The curved rib supports, and the wall stands were cut from 3/4" plywood for strength and weight. I also cut in a curved slot, so they could sand bag the bottom to hold it firm on the ground. Nothing worse than your plane falling in on you when your flying! The recessed wall panel, as well as the 3d window bezel were assembled. Again, the recessed panel was cut from flexi-ply, and skinned in .060" styrene for a smooth face finish. Once they were all assembled, they got air nailed to the back of the curved wall section. With the large curved wall section also skinned in .060" styrene, the wall is definitely starting to come together!! With all of the inserts, and window bezel assemblies in place, I sprayed the entire unit in a rubberized texture spray. This will add a mild texture to all the smooth wall panels!! This job is for a print campaign. I don't have any idea of what the final image will be used for, but I don't really need to know either! I was sent a PDF sketch, and we'll basically build everything in the sketch, plus a little bit more for safety. That way they have a small amount of room to move the camera, depending on how they lens it. Our client needed a small section of jetliner interior. The image will be a tight shot of a person looking out the window. I did a google image search of airplane interiors, and downloaded a ton of reference material, including some 3d cad renderings. Very little of this build will be full on 3d cnc machining, but more just flat cut elements. In order to make sure we were all on the same page, I 3d modeled what I thought we should be building, based off of some back and forth phone calls. With approvals signed off, I set to work exploding out the 3d computer model into flat panels for cutting on our Techno cnc. And after a while of working the file, I was able to layout all of the pieces in 2d. The biggest pain was the curved wall, making sure that everything was going to work together, after it was flat cut, and wrapped into the curved shape. As you can imagine, it was more difficult than I first anticipated! Especially because the curved wall is made up of a few different laminated layers, that all have to work together, especially the actual window bezel, which will be 3d machined. The window bezel was brought to life in 3d through Aspire alone. The vectors were created in Corel, as was the whole 2d portion of things, but Aspire was the fastest way to get from 2d to actual 3d geometry! The bezel has a dropped lip on it, and this will become the edge that we'll use to fasten it to the curved wall section. We only need 3 windows for our plane section. The actual bezel I cut from 3/4" mdf. An inexpensive material, with just the right thickness! All 3 only took about 25 minutes to cut with a 1/4" ballnose cutter. Due to the relatively thin side profile, I also cut a flat plate from 1/2" MDF. This will get fastened to the back of each window to beef it up. This plate also has a rabbet cut into it, allowing us to slip in the window shade. It won't be the full shade, just what you would see from the inside, with it in the upright position. The only other 3d-carved portion of this build was the seatback, and upright tray table. These I actually drew in Hexagon, and brought into Aspire. Only because I had drawn them for the approval render, although they would have been pretty quick to model in Aspire alone! No headrest tv's on our bargain basement flight booking! With all the carving complete on the 3d side of things, we sprayed the MDF parts wth 3 coats of a sanding sealer, then 2 coats of a high build primer. These will get a slight texture coat sprayed on them, but I wanted the base finish to be the best it could be, before the texture! 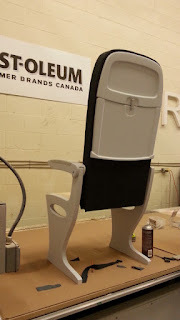 I love spraying our high build polyester primer! It flows so nicely out our HVLP gun. It is a 2-part primer, but the mix is pretty tolerant. The best thing about it though, is the fact that you can start sanding it in about half an hour! It's rock hard when it dries too. In fact, on these two guys, we had some small undercuts, that we're able to fill with just a clean clay, and we can spray right over it. The coating is hard enough (at the right thickness) that it won't break-out where the clay was used. I'm not talking HUGE holes, but small little ones. And clay is such an easy filler, that the whole process is super easy! Is that Jody sanding again?!? Of course it is!! Poor girl! Actually, I'm not a total animal, I did help a little. I have noticed that the primer does seem to get harder to sand, the longer it sits, but we try to tackle it as soon as possible after it flashes off. The copper is a lacquer paint, which means we have to get the whole thing sprayed, pretty much in one shot. If the wet lacquer hits flashed lacquer, it goes dull and dusty looking. So to make things go super fast, both Jody and I sprayed each bust together. Her on one side, and me on the other! After about 10 minutes, we masked off the copper, and sprayed the bases a bronze-ishy color. That took about an hour to dry before we could unmask them. They looked quite serious sitting on the table, with no sense of humors between them! I kinda want to keep one of them for myself, but then again, it would probably end up sitting next to my 10 foot Spanish galleon in the garage! My Techno and me, we're the best friends that could be............(sung as an 80's tv commercial)! The busts are actually mirror images of each other, facing slightly towards one another. I saved a lot of time by just slicing the one model, then mirroring every piece in Aspire. The face, then the head were the first parts of the Techno, and I glued them up as I waited for the others to slowly churn out. It took a full day for us to machine, and assemble the pieces into the two final busts. This also included addressing any of the seams that needed work as well! The last piece left was the 2 bases that the busts would sit on. These were totally modeled in Aspire, using just the 2 rail sweep feature. Super fast, super easy! I didn't want to have to miter the corners on the at all. So instead I cut the profile into the front and back pieces, and cut the sides as straight cuts. In the end, it all came together with very little trouble! Plus, I didn't have to deal with mitering them on the saw! We were pretty stoked about how they turned out! Now try squinting as you look at the bottom picture of Jody...........................................She looks like a mini me! HA HA. "Get in mah belly....Baby back, baby back, baby back ribs! Just some primer and paint, and these guys will be good to go!! The Only Thing Better Than One Bust, Is Two!